On January 10 the Commonwealth Department of Employment released new data showing an accelerating decline in collective bargaining activity and coverage, concentrated in the private sector. Here are the main findings as collated by Jim Stanford (Economist, Director for Future of Work, Australia Institute). The number of private sector workers covered by an EBA declined by 170,000 in the September quarter 2017 – one of the biggest quarterly drops ever. 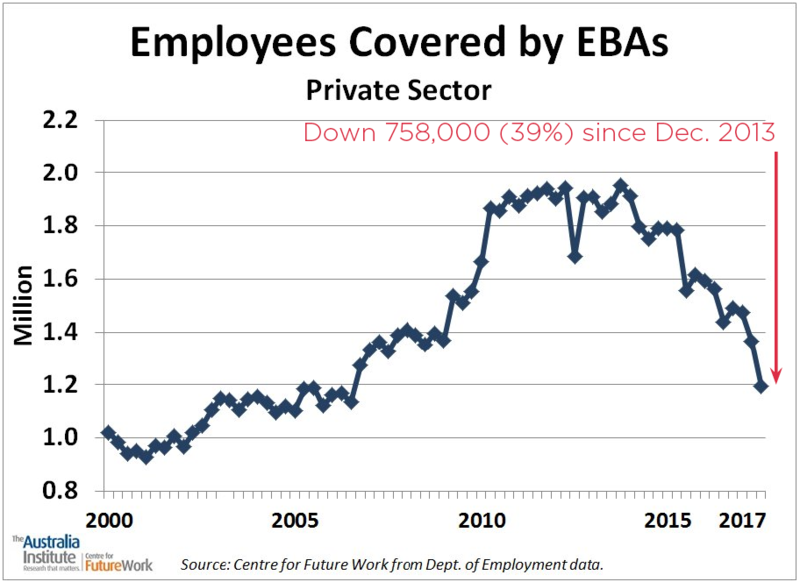 Only 1.19 million private sector workers are now covered by an EBA: the lowest since September 2006. The cumulative decline in private sector EBA coverage since the end of 2013 is now 758,000 (see graph). That’s a 39% decline in less than four years. EBAs now cover just 11 percent of workers in the private sector – compared to over 20 percent a decade ago. The erosion of EBA coverage corresponds to a rapid increase in the number of workers covered by the minimum terms of the Modern Awards. The causes of the rapid erosion of collective bargaining are many and complex: including harsh restrictions on union access to workplaces and industrial action; unlimited protection for “free riders” (who are allowed to benefit from EBAs without any obligation to contribute toward them); the growth of casual employment and “gig” businesses; the absence of an effective dispute settlement system to enforce EBAs; and more. But the consequences of the trend are obvious and predictable: wage stagnation (which even the government now admits is a major threat to Australia’s macroeconomy), declining job quality, and the disappearance of meaningful workplace voice and representation (with negative impacts for productivity, employee retention, and other key outcomes). The union movement is addressing this serious threat to employees with a campaign to “Change the Rules” governing collective bargaining and employment standards. Union members and officials are being asked to engage in a debate and activities throughout 2018 to re-build collective bargaining with the objective of a fair and prosperous Australia. Since 1993 enterprise bargaining has been a critical tool in accessing wage increases for millions of Australian employees. In fact, in the early 1990’s the wage fixing principles operated to push unions into bargaining in order to access maximum wage increases for their members. The SDA has been a bargaining union since this period and we have delivered strong wage increases and enhanced conditions for our members through several generations of Enterprise Agreements. In addition to improved conditions it should never be forgotten that SDA EBA’s have provided our members with great protection throughout the past 25 years which have been a turbulent period in industrial relations. SDA EBA’s protected members from Kennett contracts in Victoria in the 1990’s, individual contracts (WAWA’s) in Western Australia and Howards AWA’s right across the country during WorkChoices (2005-2007). Contrary to opportunistic attacks by some, bargaining has always been about getting the best possible outcome for members within the industrial parameters of the day. Some people in the retail industry have been obstructionist by trying to either prevent or frustrate the making of Enterprise Agreements. This approach is not in the best interest of our members and would deny them access to wage increases and workplace benefits. Wage stagnation has been identified as a major economic problem by the Federal Government but they too are frustrating any lift in wage growth by sitting on their hands and failing to make much needed changes to our workplace laws. We need changes that actually assist workforces and their unions deliver better outcomes through bargaining. The SDA is playing its part by continuing to bargain on behalf of its members. Remaining a bargaining union is critical and after a period of industrial uncertainty we are now seeing many companies returning to the negotiating table. In addition, a major new Agreement has been negotiated with Coles Supermarkets and it was resoundingly endorsed by members in February with 90% yes vote. The agreement is now going through the approval process with the Fair Work Commission. Negotiations are also well advanced with Woolworths Supermarkets and we are confident members in that company will have a proposed Agreement to vote on in the coming months. So, bargaining is again underway across the retail industry with the SDA in the forefront of this bargaining push. The SDA will be working closely with members, workplace Stewards and Delegates to deliver high quality Agreements that provide important protections, superior conditions and wage increases into the future.